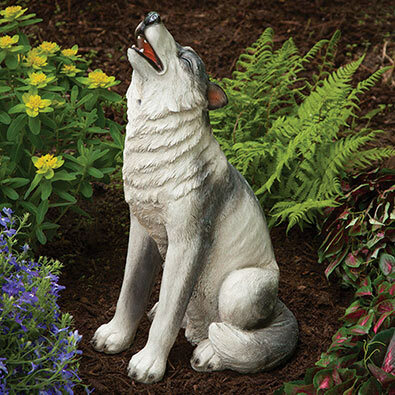 Place our motion sensor wolf near your garden, patio or walkway and watch as your guests jump in surprise as he lets out a howl when they pass by. Sculpted of designer polyresin and hand painted with lifelike details. 46cm x 19cm x 27cm. Needs 2 AA batteries, not included. Our realistic resin burro will add life to your yard, garden or patio. Place him where he can sense passersby and he will blurt out a welcoming hee-haw, charming your guests. Hand painted in remarkable airbrushed detail. Requires 2 AAA batteries, not included. On/off switch on battery compartment. Stands 36cm tall x 10cm wide x 38cm long. When anything or anyone crosses its path, this frog with intricate leaf detailing will scare pests away with motion activated ribbits and eyes that really light up in flashing bright yellow. Made of weather resistant, hand-painted polyresin. Measures 12cm x 22cm. Requires 2 "AA" batteries, not included. Pass by this majestic hunter and he growls out a warning to keep your distance from his just-caught fish. An authentic polyresin sculpture of a detailed standing black bear with a hand painted steelhead salmon. A perfect gift for a wildlife lover or for mountain and lake cabin décor. The internal sound sensor reacts to movement up to 46cm away. Measures 38cm x 18cm x 13cm. Uses 2 AAA batteries, not included. On/off switch included. Bring a touch of country barnyard charm to your home with our adorable nanny goat sculpture. Standing proudly, her realistic and lifelike detail is captured in hand painted resin. Place it by your entry, walkway or flowerbed and she bleats out a realistic "bahhh" to any passerby, with its sound activated mechanism. On/off switch on battery compartment. Requires 2 AA batteries, not included. Measures 38cm x 36cm x 11cm.